Slanderous graffiti calling Israeli President Rivlin an 'apostate Nazi' found in Bnei Brak. 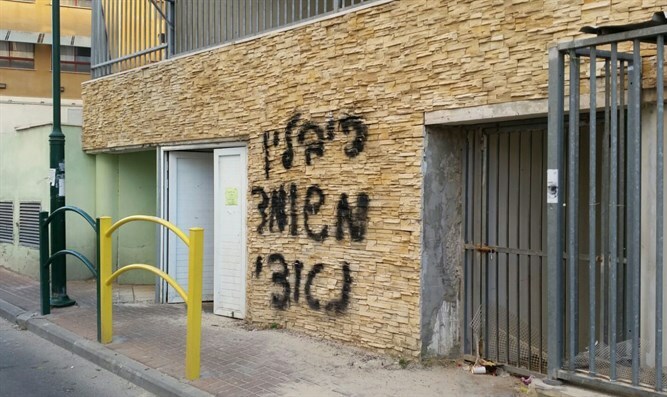 Slanderous graffiti denouncing Israeli President Reuven Rivlin as a “Nazi apostate” was found spray-painted on the wall of a building in the predominantly haredi city of Bnei Brak in central Israel Wednesday morning. Last week, anti-Rivlin graffiti was found in a Bnei Brak school yard, comparing the president to "an idol in the Temple". The incident occurred about a month and a half after the president visited the school in question. “Being a public servant at times puts you in the line of fire,” the president continued. Police have opened an investigation into the graffiti. According to the Kikar Hashabat news outlet, the two acts of vandalism were part of a backlash against Rivlin’s visit to the Bnei Brak school almost two months ago. Prime Minister Binyamin Netanyahu denounced the graffiti, saying those responsible had no place in public discourse in Israel. “Graffiti like this deserves strong condemnation,” said Netanyahu. “There is no place for this in public discourse in Israel.